Thought I'd post my current ride. Wow how things of changed. Most of our money gets dumped in the house and boat now. The vehicles are just that, means of transportation. Though I do like them to look nice still. Dumped an 08 Escape for this, I hated the escape. Nice! Bet she pulls the boat just fine. Yep it does. Luckily I only need to tow it once or twice a season. Nice! That's a good looking truck. Went for the diesel huh? I'm thinking about the new GM midsize trucks, when the diesel comes out next year. Waiting to hear pricing and fuel mileage. Don't really tow a lot, but the torque and extra fuel mileage is what interests me. Same here. For the first time, I'm really interested in that diesel engine. Yeah, I was on the fence, but when we need to pull the boat out of the water, other than begining and end of season its nice to be able to do it myself. And I just like the power of the diesel and the sound out of the MBRP 5" exhaust. 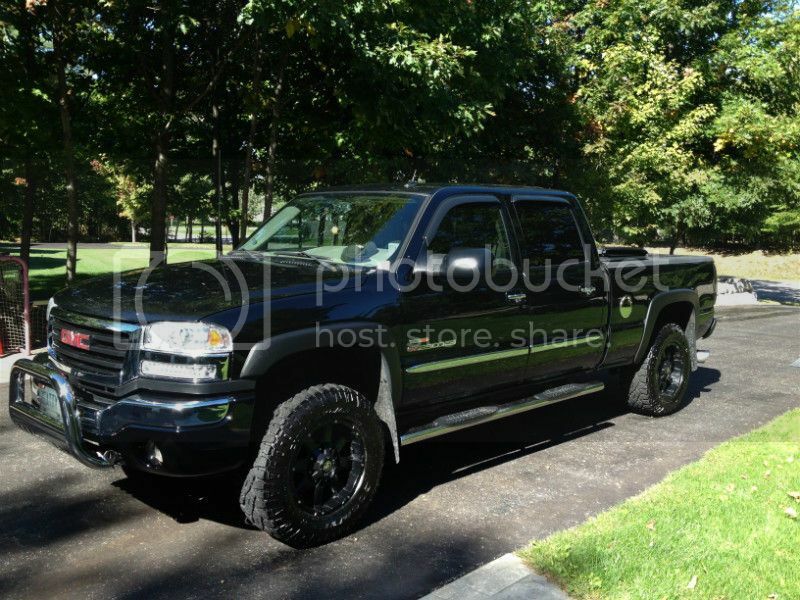 Best of the Duramax breed with the LLY engine! The earlier LB7 had injector problems, the later LMM has occasional oil pressure problems and began the descent into aftertreatment emissions systems. Still the wise choice for a new diesel. The Cummins ISB may have lost its title as the go-to with the current aftertreatment systems; perhaps light duty installations in the Dodge chassis are fairing better, but the 6.7 ISB medium duty installations (KW T series, Freightliner M2, et al) can't stay out of the shop with DEF dosing module problems. Ford hasn't installed a confidence-instilling diesel since the T444E went away. I got me one of them from Canada!!! Had to run a switch to be able to override the dammed auto headlights!